Most retailers have adopted omni-channel strategies to meet consumers’ demand to browse or buy whenever and wherever they choose. But enabling everything from mobile point of sale (POS) to in-store pickup of online purchases has made inventory control and product logistics far more difficult. The complex new retail environment is increasing a variety of risks, including the risks of internal and external theft, paperwork and operational errors, system issues, and vendor fraud. The retail industry is struggling to manage the emerging risks it faces. As the industry transitions from bricks and mortar to “bricks and clicks,” the capabilities of existing systems are being stretched thin, and many retailers have not fully integrated the new technology required to manage loss and reduce shrinkage effectively in an omni-channel world. 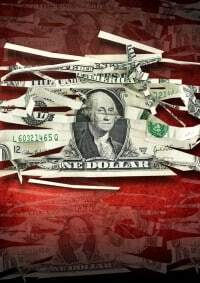 To better understand the current state and emerging challenges of the retail industry, in the summer of 2015 PricewaterhouseCoopers (PwC) conducted an online survey of loss prevention (LP) professionals within US-based retail organizations, including big-box stores, specialty retailers, department stores, grocery chains, and drug stores. The survey results, highlighted below, suggest a need for many retailers to rethink their LP strategies, organizations, and practices. Among other things, retailers must embrace formal root-cause analysis and the use of data analytics to remain competitive in a dynamic, increasingly risky environment. We asked LP professionals to report on their organizations’ shrink rates over the most recent twelve-month period. Among our survey respondents, the average retail shrink rate was 2 percent, and the average cost shrink rate was 1.2 percent. According to survey respondents, internal and external theft are by far the main sources of shrink, accounting for 36.4 percent and 35.1 percent of the total, respectively. These results represent a significant shift in the industry. In the past, most retailers have reported that internal theft was significantly higher than external theft, due to employees’ access to cash registers, alarms, and inventory. Another surprising finding is the significant percentage of shrink that is due to paperwork and operational errors (17.8 percent) and system issues (6.9 percent). Typically, the industry doesn’t break out system issues as a potential root cause of shrink; rather, these issues are integrated into the category of paperwork and operational errors. But in our view, they deserve a separate category. System errors are exacerbated by dynamic omni-channel customer fulfillment and reverse flow (returns) logistics. We believe that the relative amount of shrink attributed to system issues by survey respondents (6.9 percent) is artificially low, the result of confusing operational errors with system errors—including errors that result when transitioning from manual to computerized processes, or integrating new systems as part of implementing an omni-channel strategy. The vast majority of survey respondents (78 percent) use internal experts and historically reliable procedures to identify sources of shrink. 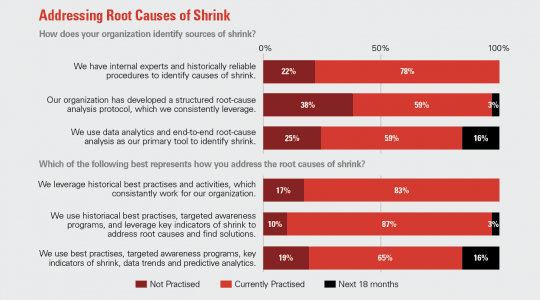 More than half (59 percent) have developed a structured root cause analysis protocol that they use consistently, and the same percentage report using data analytics and end-to-end root cause analysis as their primary tool to identify shrink. When asked how they address the root causes of shrink, the vast majority of respondents (83 percent) said they leverage historical best practices and activities that work consistently. Almost 9 in 10 (87 percent) use historical best practices and targeted awareness programs and leverage key indicators of shrink to address root causes and find solutions. Just over two-thirds of respondents (65 percent) said they go one step further, leveraging data trends and predictive analytics to identify the root causes of shrink, and another 16 percent plan to adopt this strategy in the next 18 months. Use cross-functional teams to develop hypotheses and analyze results. Leverage data analytics and systems-process mapping to test hypotheses. Develop a strategy to reduce shrinkage and corresponding mediation plan based on results. Identify and decompose shrink drivers and quantify their impact over time. Check out the full article, “Rethinking Loss Prevention and Shrink Management,” which was originally published in 2016, to learn best practices when it comes to collecting and analyzing data to address current LP risks. This excerpt was updated October 3, 2018.